Paris, collection of Charles Auguste Louis Joseph, duc de Morny (1811-1856). 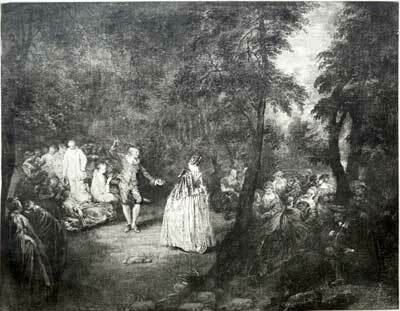 Although the duc de Morny was one of the most important early nineteenth-century collectors of Watteau, it is not easy to trace Le Bal champestre in his various sales. It may have been the painting sold in the de Morny sale of December 16-18, 1841, lot 83: “WATTEAU (Antoine) . . . Le Menuet. 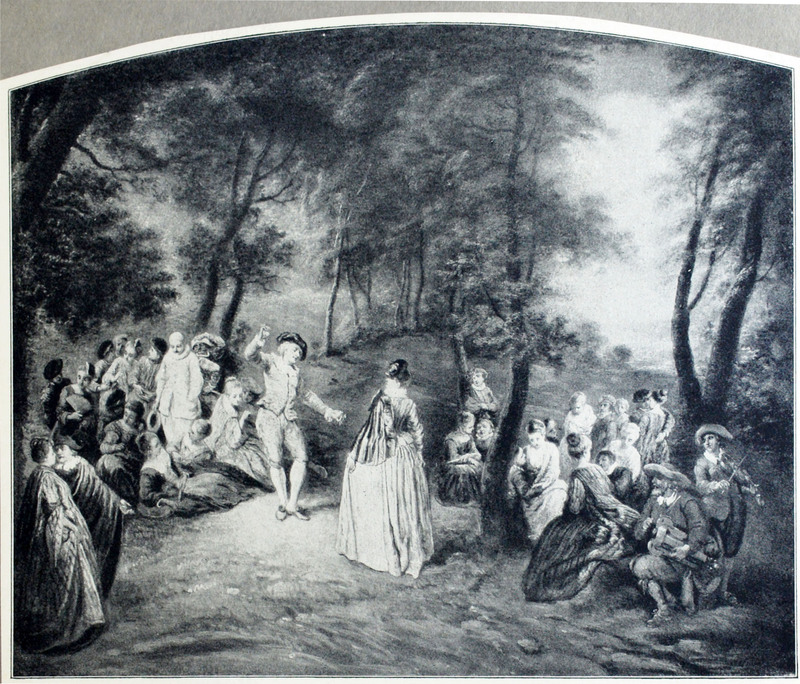 Composition capitale et bien conservé.” Another possibility is an unnumbred lot in the sale of de Morny property, October 6, 1877: Un portrait d’homme, une Fête italienne, ces deux tableaux attribué à Watteau.” Adhémar associated de Morny’s version of Le Bal champestre with a Watteau painting sold in his 1865 sale, lot 114, but as the description in that catalogue makes clear, lot 114 was a version of L’Amour paisible (our copy 2). Paris, collection of Prince Paul Demidoff (Count Pavel Pavlovich Demidov, 2nd Prince of San Donato) (1839-1885; industrialist). Demidoff’s ownership is attested to by a Braun photograph that was taken before 1887. Paris, collection of chevalier Auguste-Etienne-Louis Tabourier (1822-1898; cloth manufacturer). 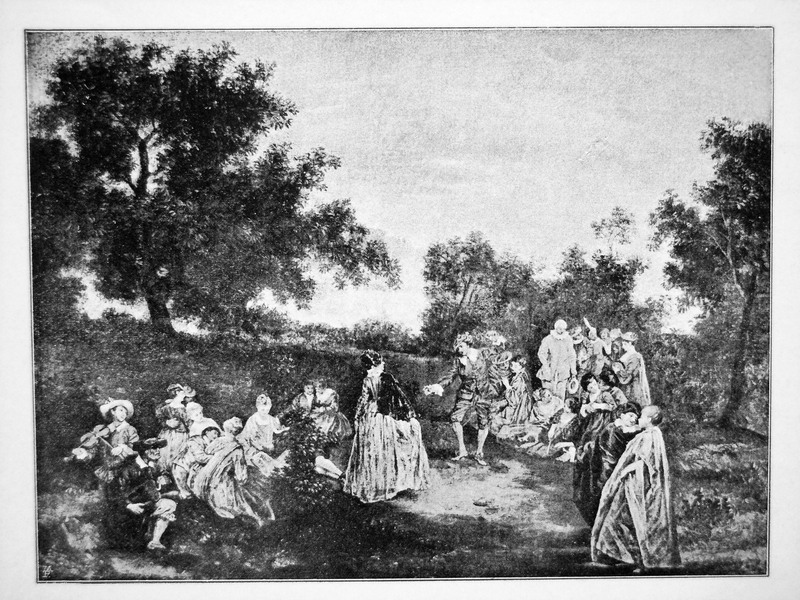 His sale, Paris, Hôtel Drouot, June 20-22,1898, cat 113: “WATTEAU (ANT.) . . . La Récréation champêtre. Dans un parc, un homme marquant la mesure d’une danse avec des castagnettes, a pour vis-à-vis une jeune femme qui s’apprête à faire une révérence. A gauche, un groupe de nombreux personnages au milieu desquels le costume blanc d’un pierrot jette une note claire. A droite, au premier plan, deux musiciens accompagnent les danseurs en jouant, l’un de la vielle, l’autre du violon. Derrière eux, des couples enlacés. Haut., 44 cent. ; larg., 54 cent.“ Sold for 6,000 francs according to an annotated copy of the catalogue in Rijksbureau voor Kunsthistorisches Documentatie. Paris, sale, November 22, 1904, sold to Eugène Fischof, for 18,000 francs. Fischhof (1853-1926) was the son-in-law and New York representative of the Parisian dealer Charles Sedelmeyer. The reference to this sale comes from an annotated page cut from the 1905 Sedelmeyer catalogue (cited below) in the Service de documentation, Département des peintures, musée du Louvre. Curiously, the only recorded sale on November 22, 1904, is the sale of the painter Paul-Joseph Blanc, contained no painting that corresponds to Le Bal champêtre. 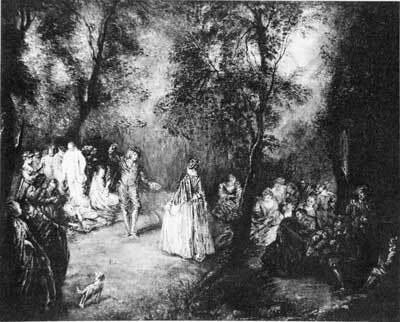 Paris, Sedelmeyer Gallery, 1905, cat 74: “WATTEAU (Antoine) . . . «La Récréation champêtre» In a park, a man marks the measure of the dance with his castanets. His partner, a young woman, is on the point of making a curtsey. 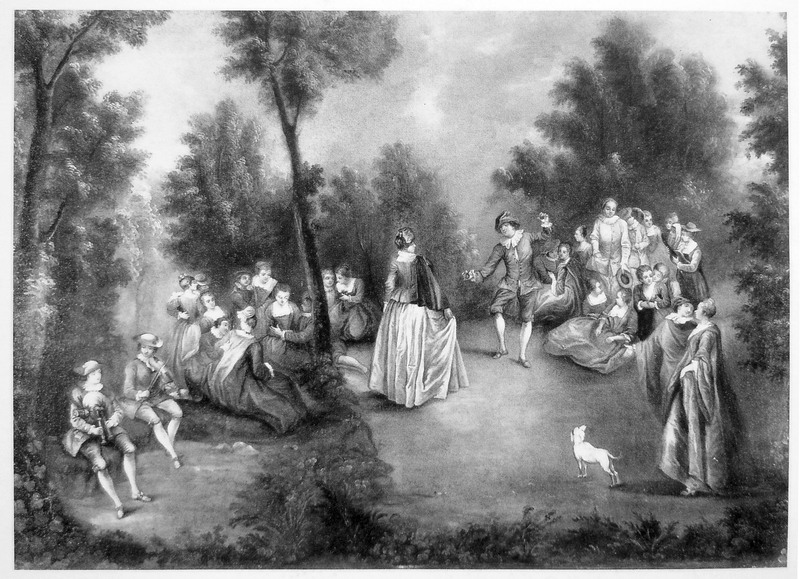 On the left, a group of several persons, amongst whom a Pierrot dressed in white is conspicuous. In the foreground, on the right, two musicians accompany the dancers. Beyond, amorous couples are seen between the trees. Canvas. 17 ½ in. by 21 in. Engraved by Larmessin. From the Collection of the Duc de Chabot, Paris, 1769. M. Tabourier, Paris, 1898.” According to an annotated sheet in the files of the Service de documentation, Département des peintures, the painting was priced at 12,250 francs. New York, Marie Sterner Gallery. Springfield, Opening Exhibition (1933), cat. 68 (Watteau, Pastoral Scene, lent by the Marie Sterner Gallery). Braun, Catalogue général (1887), no. 16494. Dacier, Vuaflart, and Hérold, Jean de Jullienne et les graveurs (1921-29),under cat. 311. Réau, “Watteau” (1928), cat. 85. Mollet, Watteau (1943), no. 16. Adhémar, Watteau (1950), under cat. 131. Macchia and Montagni, Watteau (1968), under cat. 112. Zimmerman rightly presented the Demidoff and Rasquinet versions (the latter our copy 2) as two separate pictures, the former with a straight top and the latter with an arched top. Adhémar incorrectly listed the two as though they were one and the same painting. Also Adhémar incorrectly listed the Strauss picture (our copy 3) as though it too were all one and the same painting. Despite the apparently lengthy provenance of this painting, there are curious lacunae. Sedelmeyer’s unproven assertion that this painting was in the Chabot collection, although repeated by all subsequent scholars, is a distressing example of an unmindful repetition of errors. In her listing of the provenance for the Tabourier-Sedelmeyer painting, Adhémar wrongly claimed it had previously been in the Dubois sale of 1861. However, that sale (January 21, 1861, lots 19-12) lists three paintings classified only as “d’après Watteau” and each titled Récréation champêtre. These must have been three copies after Watteau compositions, but there is no specific tie to Le Bal champestre. While our composition was entitled Récréation champêtre when it sold from the Tabourier collection and when it was with Sedelmeyer, this was only a generic, rather than a traditional and specific title. When, as in the Dubois sale, the term was applied to all three paintings, it has even less significance. Nonetheless, Macchia and Montagni, as was their habit, unquestioningly continued Adhémar’s error. Zimmerman, Watteau (1912), no. 141. Dacier, Vuaflart, and Hérold, Jean de Jullienne et les graveurs (1921-29), under cat. 130. Macchia and Montagni, L’opera completa di Watteau (1968), under cat. 112. When Zimmerman illustrated this painting in 1912 and listed it as in the Rasquinet collection, he was relying on a Braun photograph that had been taken before 1887. Thus we cannot be sure of the picture’s whereabouts in the late nineteenth or early twentieth centuries. Zimmerman rightly considered the Rasquinet and Demidoff versions as two separate pictures, the former with a straight top and the latter with an arched top. Adhémar incorrectly listed the two versions as though they were one and the same painting, as did Macchia and Montagni. Zimmerman, Dacier, Vuaflart and Hérold, Adhémar, and Macchia and Montagni, rightly considered the Rasquinet version a copy after the lost original. However, it is not an exact copy. Beyond the issue of the arched top, the landscape is quite different from what is seen in the Ravenet engraving and the various painted versions gathered here. The landscape is more open, with the trees spaced wider apart and more sky visible at the right. Also, this version lacks the barking dog in the foreground. Paris, collection of Jules Strauss (1861-1943; banker). His sale, Paris, Palais Galliera, March 7, 1961, lot 30: “WATTEAU (École de Jean-Antoine) . . . Le bal champêtre. 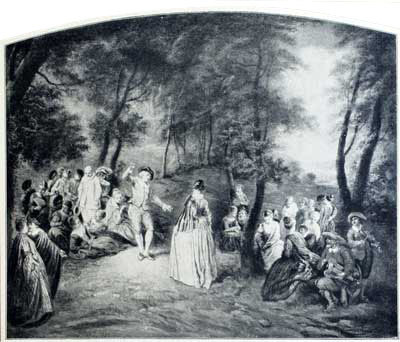 Dans une clairière, de nombreux personages sont assemblés autour d’un couple dansant un menuet. Le jeune homme, vêtu de rose, equisse un pas devant une jeune femme en cape violine et robe blanche. Toile (restaurations). Haut., 0m 45; Larg. 0m 55. Cadre en bois sculpté. Réau, “Watteau,” (1928), cat. 85. Adhémar, Watteau (1950), cat. 131. Although this picture is painted in a very feathery manner quite unlike Watteau’s, and although the arrangement of the trees differs greatly from the Ravenet engraving, Réau believed it to be the original from Watteau’s hand. Moreover, he identified it with the painting putatively sold from the Chabot collection in 1769. Réau also claimed that it had been in the Tabourier sale in 1898 but a comparison with the one illustrated in the Tabourier catalogue shows this cannot be. Adhémar changed and enlarged its provenance. She rightly did not identifying it as being the original in the Chabot sale, and termed it only a “sujet semblable.” On the other hand, she claimed that this picture had been in the Dubois, Tabourier, and Sedelmeyer collections before being owned by Jules Strauss. Yet, although the Strauss version has the same measurements as the Tabourier-Sedelmeyer picture, the execution of this version is different, there is a dog in the foreground, and the landscape setting is quite different. This picture must then be accounted as yet another copy. The sale catalogues of this painting confuse the provenances of these paintings even further. London (? ), collection of the Duke of Lucca. This provenance is cited in the 1908 sale catalogue which follows but the painting cannot be located in the two sales of this duke’s collection held in London on July 25, 1840, and June 5, 1841. This version of Le Bal champêtre has not been mentioned in the Watteau literature. The figural portion follows the Ravenet engraving except in certain l details, such as the omission of the dog at the right. Although it lacks the figure at the far left as well, there evidently was a condition problem in this area. The landscape is decidedly different from Watteau’s, and suggests more the nineteenth rather than the eighteenth century. Despite the optimistic attribution of this picture to an artist of the late eighteenth century, it appears to be considerably later in date. It is merely a poor quality copy after the Ravenet engraving.